Understand painful mouth sore symptoms, including 7 causes & common questions. Painful mouth sores are an uncomfortable condition that can make everyday activities such as eating and talking very difficult. Painful mouth sores are often a signal of an underlying infectious or systemic condition that requires medical attention. See an image of an aphthous ulcer here and here. 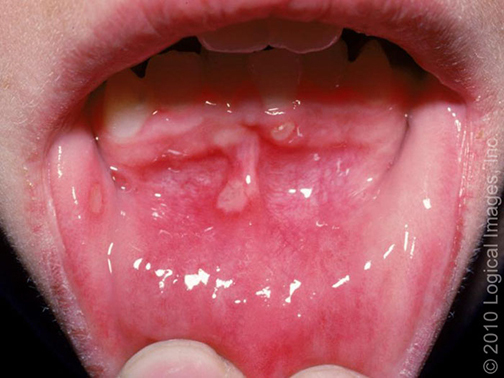 If the ulcers recur (keep coming back), this condition is referred to as “recurrent aphthous stomatitis,” more commonly known as “canker sores” [1-3]. The mouth is the body’s first line of protection against different pathogens and toxic substances, and as a result, is susceptible to inflammation from a variety of pathogens and different causes. Infectious: There are various bacterial infections that are associated with painful sores that appear in the mouth, especially the soft or hard palate. Furthermore, viral infections often result in an infectious double-hit to the body since they often infect both the structures of the upper respiratory tract such as the nose and sinuses as well as the mouth. Finally, there are certain fungi that have a predilection for infecting warm, damp areas of the body such as the mouth. Painful spots caused by fungi can range from red and patchy to creamy and white. Allergy: Drug reactions can be a serious, life-threatening cause of painful mouth sores that require immediate attention. Many drugs used for conditions such as infections, epilepsy and even mood disorders can trigger painful mucosal and skin reactions. Many dermatologic conditions (both primary and secondary) can result in chronic, inflammatory rashes or lesions that prefer the mucosal linings of the body, including the mouth. Primary: Primary dermatologic causes refer to cutaneous conditions that are the result of inherent problems with the skin and its components. Many of these conditions can affect the mouth and result in painful ulcers. Secondary: Secondary dermatologic diseases refer to conditions in other organ systems such as the GI tract that have sequelae in the mouth. Systemic autoimmune conditions that affect multiple body parts such as inflammatory bowel disease and lupus often have symptoms that affect the mouth and have involvement in other systems such as vascular, neurologic and cardiac. The mouth is often the first contact with environmental substances such as food and liquids that may cause irritation, allergic reactions and painful mouth sores. Moreover, the mouth is easily susceptible to environmental factors related to trauma. Irritants: Tobacco and alcohol are serious irritants to the body. Tobacco and alcohol can cause significant irritation of the mouth and its structures and even cause some types of cancer. Tobacco products are associated with 64 percent of cases related to oral cancer . Tobacco and alcohol can cause excess cell growth in the mucosal lining of the mouth due to chronic irritation and result in painful sores. Diet: Different types of food can also be a trigger for the development of painful mouth sores. Foods that seem to be particularly causative include spicy or acidic foods like oranges, eggs, strawberries, and even chocolate. On the other hand, diets deficient in certain nutrients such as vitamin B12, folate or iron can also result in painful sores of the mouth. A painful mouth sore may be the first sign of a cancerous process. In general, any growth is the result of cells dividing and growing uncontrollably. Sometimes there is a genetic mutation in DNA or a specific protein or failure in an important checkpoint that results in this unchecked growth. These abnormal cells accumulate to form a noticeable lump or lesion. A lump (also known as a tumor) can be benign; however, if this lump grows and invades the body it is considered malignant. The list below shows results from the use of our quiz by Buoy users who experienced painful mouth sore. This list does not constitute medical advice and may not accurately represent what you have. A mucocele (mucous cyst) is NOT a serious tumor. It's typically caused by repeated biting leading to leakage of mucous from damaged mucous ducts, which accumulates and creates a cyst. It's most commonly found in kids, and usually inside the lower lip but also possibly under the tongue or in the inner cheek. The majority of painful mouths sores usually resolve without treatment in a few weeks. There are over-the-counter medications that are targeted to alleviate the pain associated with some painful mouth sores. For example, there are mouth rinses and topical products you can buy and use at home to help treat symptoms. Antibiotics/Antifungals: If your symptoms are caused by a bacterial or fungal infection, your physician will prescribe medications specific to the pathogen. However, it is important to remember that viruses do not respond to antibiotic treatment and usually only need rest, fluids and other supportive measures. Anti-inflammatory medications: Steroids and specific anti-inflammatory medications are often used in the treatment of multiple autoimmune diseases and primary dermatologic conditions. They are targeted to control inflammation and may help alleviate symptoms. Treat the underlying cause: Secondary causes of painful mouth sores due to systemic diseases will only improve with appropriate diagnosis and treatment of the underlying cause. This highlights the importance of following up with your doctor on any symptoms you may experience. Cancer therapy: If your painful mouth sore and associated symptoms are due to a benign or malignant cancer, your physician will discuss treatment options including surgery, radiation or chemotherapy. Since many of the causes of painful mouth sores are infectious or environmental in nature, it is important to protect yourself from pathogens by maintaining proper hygiene such as hand washing and avoiding known triggers. These strategies can go a long way in preventing the incidence of painful sores in the mouth. Are painful sores in the mouth dangerous or life-threatening? A painful sore in the mouth can be the first sign of serious skin reactions that can be life-threatening. A painful spot in your mouth may also be a sign of a cancerous process, so never ignore your symptoms. It is always important to follow-up on your symptoms since many of the underlying conditions often require follow-up and treatment. How long will the painful sore in my mouth last? The duration of your symptoms will depend on the specific cause. For example, bacterial causes of painful sores in the mouth often go away with the resolution of the underlying bacteria whereas autoimmune causes of painful sores in the mouth may be a lifelong problem. Are painful sores in the mouth an acute or chronic condition? There are some cases in which painful mouth sores can be chronic, especially those associated with autoimmune conditions like inflammatory bowel disease. Furthermore, viruses such as herpes can persist within the body and recur in times of physical and emotional stress. 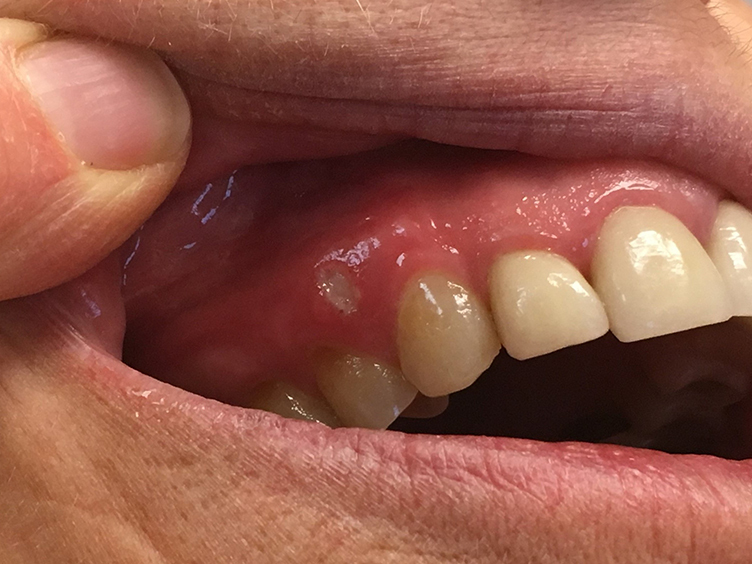 Painful mouth sores related to chronic habits such as tobacco and alcohol may also persist and become chronic whereas bacterial infections are more acute. A cold sore is a painful mouth lesion that is caused by the herpes simplex virus. This virus is spread through bodily fluids and can be transmitted via kissing, sexual relations and even sharing drinks. These sores usually look like small fluid-filled blisters clumped together that often occur right on the lips or at the border where the lips meet the skin on the face. Canker sores (also known as aphthous ulcers) on the other hand are non-contagious lesions usually of inflammatory etiology. They can result from a variety of causes including food and systemic conditions. What color is the area right around your sore/blister/bump?